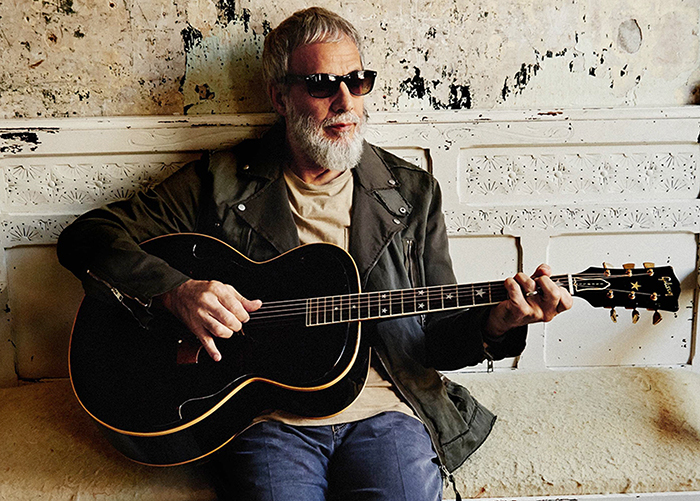 CONTENT © DANIEL GLUSKOTER The Yusuf / Cat Stevens Peace Train rode back into the Bay Area for the first time in nearly 40 years on Friday evening for a stop at the Masonic. One of just 15 performances worldwide, only six of which were scheduled for North America, the completely sold out show continued Stevens recent reemergence as a performer in the public eye following a three decade absence. The engaging 66 year old Brit, inducted into the Rock ‘N’ Roll Hall of Fame earlier this year, famously indicated that he underwent a spiritual awakening after a near death experience when he nearly drowned in the Pacific while swimming off the coast of Malibu, leading to his conversion to Islam and changing his name to Yusuf Islam. While his newfound religious conviction gave him inner peace, the fact that he chose an unpopular religion which is misunderstood by most westerners in light of it’s radical misinterpretation by many extremists served to contribute to the rewriting of pop’s musical history. Fast forward 10 years after being denied entry to the United States when he was ludicrously placed on the No Fly List as a gift of the brainiacs in the Bush-Cheney administration ( always vigilant in their efforts to keep the public safe from iconic musicians ), the rechristened Yusuf Islam arrived on stage to a stirring ovation. The singer/songwriter of so many enduring classics took to the stage sporting a graying beard and wearing glasses with a dark coat and jeans along with a five man backing band featuring guitarist Alun Davies, who also provided backing vocals while accompanying Stevens during his most prolific period from 1970 to 1977.
synth-pop hit “Remember the Days of the Old Schoolyard” from 1977’s “Izitso” served as the first of many reminders of just how prolific an artist Stevens continued to be just shortly before walking away from music. As “Where Do the Children Play ?” continued the theme of romanticizing about the old days thru stories of hope, innocence and optimism, the backdrop to the stage started to come into play as other band members would move around and hang out in different areas, creating the appearance of passengers waiting at a dusty old train station, with an illuminated marquee on the platform announcing arrival in San Francisco. This created a perfect setting for Curtis Mayfield’s “People Get Ready” ( “there’s a train a-coming” ). A lively cover of The Beatles “All You Need Is Love” followed by “If You Want to Sing Out, Sing Out” had the crowd fully involved with most singing and clapping along to the final two songs prior to intermission. Delivering a progressive cover of Jimmy Reed’s “Big Boss Man,” the first of five songs played from the fine new Rick Rubin-produced album “Tell ‘Em I’m Gone” to begin the second part of the show, Yusuf then introduced a memorable rendition of Nina Simone’s “Don’t Let Me Be Misunderstood,” a song most often associated with The Animals that he recorded for “An Other Cup,” his first album after resuming his career in 2006. A touching “Oh Very Young” continued the pattern of many short songs that seemed to end too early. Perhaps some were abbreviated to help accommodate such a long setlist, more likely they were reflective of a different era that catered to radio programmers looking to fill three minute slots. Either way we were left wanting more. Returning to the stage with a dedication of the bluesy “Gold Digger” to Nelson Mandela, the final song of the evening from the new album, Stevens brought everyone to their feet for good with the opening strains of “Peace Train” and it’s idealistic verse that asks “Now I’ve been crying lately, thinking about the world as it is, why must we go on hating, why can’t we live in bliss ?” Clearly a question as easily applicable to current times today as when it was first written in 1971 if ever there was one. “Morning Has Broken,” another top 10 hit in both the US and UK from “Teaser & The Firecat” brought the 29 song, hour-fifty minute set to a close, leaving one with the emotional and near impossible matter to address of what if the world hadn’t lost three full decades of songwriting from a talent this great ? One can only speculate.